Hayden Hawks quickly made a name for himself in ultrarunning over the past year and, now, he’ll test himself against the field at Transvulcania. In the following interview, Hayden talks about his recent Zion Traverse FKT, what he thinks of the atmosphere on La Palma ahead of the race, how he’s trained for Transvulcania, and how he’ll approach the race. You can find out more about who’s racing this weekend in our men’s and women’s previews and, then, you can follow along with our live coverage of the race. iRunFar: Mauri Pagliacci of iRunFar, and I’m here in the island of La Palma once again for the Transvulcania Ultramarathon 2017. I’m with Hayden Hawks from the U.S., right? Hayden Hawks: Yes, from Utah. Hawks: St. George, Utah, which is right next to Zion National Park. I live literally 15 to 20 minutes from Zion National Park. iRunFar: So you’re pretty aware of the park. You recently made a super awesome FKT. Hawks: Yeah, I attempted that about three weeks ago and was able to be lucky enough to break the FKT there. I love the park. I train a lot in the park. It’s a great place to get some good vert. It’s one of my favorite places to train. iRunFar: This FKT you did a few weeks ago, was it a good confidence booster for Transvulcania? Hawks: Yeah, for sure. It was a little less than 49 miles, so the distance helped me realize I was ready for the distance and that I can do the distance. There’s some really good vert in the FKT as well. That helped me get ready as well. It was more of a training run to get me ready for this race and to give me some confidence going into Transvulcania. iRunFar: Is this the first time you’ve jumped to Europe to race? Hawks: For ultra, yeah. I was in the world championships last year in Bulgaria and raced that. Hawks: Yeah, as the U.S .team, we won gold. I took fourth overall in that. This is my first time for ultramarathons. iRunFar: So for ultrarunning and Skyrunning—what do you think about the vibe, the ambiance, the course, and the competition? Hawks: It’s awesome so far. I just got back from the expo. I was over there picking up my race number and everything. I ran into Luis [Alberto Hernando] there, the man, the legend. He had a little crowd following him the whole time. It’s amazing to see how the people are so into this race. They love it. They love the runners. They get really excited for it. I’m really excited to race on Saturday. It’s nice to have people there to cheer you on, to line the streets… it makes you feel alive. It makes you get pumped up especially during those hard times during the race. iRunFar: About the course, you’re a super fast runner. We’ve seen that like at The North Face Championships last year in San Francisco. Here, the course is different. It’s challenging. There’s a lot of vertical up and down. What do you expect from yourself for Saturday? Hawks: Yeah, I’ve been getting ready for it by doing a lot of vertical stuff and a lot of technical-type stuff. I feel like I’m prepared for it definitely. I was over in Flagstaff a couple weeks ago doing some training runs with Jim Walmsley and Tim Freriks. We went down to the Grand Canyon there. The Grand Canyon, it’s pretty technical in some spots. There are some really good downhills and some really good uphills. I think, if anything, it’s going to help me get ready for this race. There are a lot of ups and downs in this race. I have been talking to a lot of the locals, people who know this course pretty well, and they’ve been telling me that it’s pretty runnable. It is technical; there are some really steep climbs. On paper, it looks like it’s really, really tough, but they said it’s runnable. Don’t think that it’s not runnable. I’m really excited about that knowing that I can use my leg speed a little bit and maybe push that downhill really hard at the end, that little road section toward the end. I have some good leg speed, so if I need to make up some time or push ahead, I think I can do it. iRunFar: About the competition—you’ve been in super competitive races like at the world championships last year and San Francisco, but what do you think of this kind of competition with more European guys, guys like Nico Martin from France or whoever? What do you think? Hawks: Yeah, it’s extremely competitive. There are a lot of guys here that have been doing this for years. They’ve won UTMB, big races, and so yeah, I’m really excited for that. I don’t know. With me, I’m very competitive, so when I go to a race and know there will be guys there to push me and to run with and to bring me to that next level, it gets me really excited. It brings out the best in me, I feel like, when I have guys to push with. I’m really excited for that. That being said, it’s going to be a tough race. There are a lot of guys out there that could easily win or podium in this race. I just hope on that day I have what it takes to make the podium and hopefully come out with the victory as well. 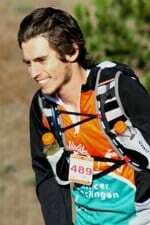 iRunFar: There’s been in previous years, other U.S. guys who have run super fast from the start like Zach Miller or Sage [Canaday] or even Dakota [Jones] who has won the race. Do you have any certain strategy for the day? Are you going to go out super fast or speculate anything? Hawks: I can’t tell you my strategy… No, I’m just going to run how I know how to run. Whatever feels comfortable to me—me and my coach, we’ve been talking, and he just told me, “Run within yourself the first half of the race. If you feel like there’s an opportunity you can maybe push a little bit but still feel comfortable, do it. Just make sure you have your legs for that downhill at the end.” That’s where that race has been won every single year is in that downhill. That’s where Luis has really taken advantage and pushed it that downhill, and he’s come out with the victory the last three years. I’ve kind of done a lot of studying. I’ve done my homework. I know what I need to do. I’m very confident in my race strategy. That being said, you never know with ultramarathon. iRunFar: It’s a long day out there. Hawks: Exactly. I’ll just hope for the best and try to play out my strategy the best I can. iRunFar: Thank you so much for your time. Enjoy your beautiful day here on La Palma. Hawks: It’s gorgeous. I love this area. You feel like you’re in paradise. iRunFar: Yeah, it is, right? iRunFar: It’s going to be rewarding at the top. Hawks: Exactly. It’s going to be rewarding. I can just kind of relax and chill for a day or two after the race. iRunFar: Best of luck for Saturday. See you out there. Hawks: Yeah, see you out there. Mauricio Pagliacci lives in Neuquén, in the north of Patagonia, Argentina. He's spent over half of his life on the trails, and once ran a bit faster than now. He owns the site Trail Running Argentina and helps with iRunFar en Español. Going to be a great race, but someone needs to tell Hayden that he isn’t doing an intermission interview during the NHL playoffs. Perhaps IRF could just pre-record hundreds of interviews with either Chris Mocko or Dakota Jones, and then dub over parts of each recording to sub-in the appropriate runner’s name depending on the race. Interviewers shirt game is strong. Something tells me he’s going to be surprised by the 10 mile downhill if he pushes it too hard on the climbs the first 50k. I hope I’m wrong though as I’d love to see an American win again at TV! Good interviewer — great vibe (cross between Pedro in Napoleon Dynamite and Freddy Mercury. How did Hawks do — did all of his wildest dreams come true? He seemed really confident going in. I wonder what slowed him down in the race. Injury? Nutrition? Pushed too hard too early? Rather early in the race, didn’t he?